Confession: I ate cereal for breakfast for over 30 years. I didn’t know any better. It was what my parents gave me, and they wouldn’t steer me wrong. Right? Although I was really intelligent and referred to as the “model student,” I had a lot of health problems growing up in addition to being a stressed out mess most of the time. 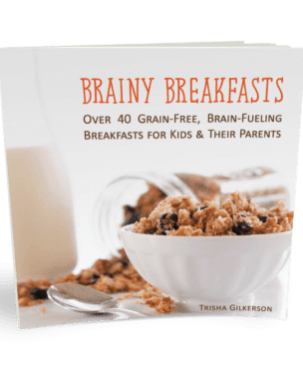 Knowing what I know now about nutrition, I always wonder what would have happened had my parents fed me some real brain food in the morning. You know—something much more nourishing than cereal that has basically be stripped of all nutritional value. 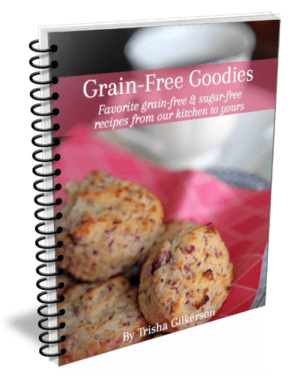 Looking for gluten-free recipes and resources? This Everything Gluten Free page is a library of everything gluten free we’ve worked on. For the past 8+ years, I have placed a priority on breakfast. It is by far my largest, most nutrient dense meal of the day. Sometimes it doesn’t look like breakfast. Salmon and spinach anyone? Care to join me for some liver pate? I know, salmon and liver aren’t traditional breakfast meals but they have been transformative in my health. Having said that, sometimes I do crave a real breakfast food. Something akin to the all-American staple. What do I turn to? But not just any pancakes. I live and breathe carrot cake anything. The spices and the carrots just make me happy. Combine these ingredients into a brain-food laden pancake and you have yourself a 5-star breakfast that is guaranteed to keep your brain functioning at it’s peak performance level. Ok—maybe they can’t promise that, but I assure you, these bad babies in the pancake world will nourish your brain and fuel your body until lunchtime. 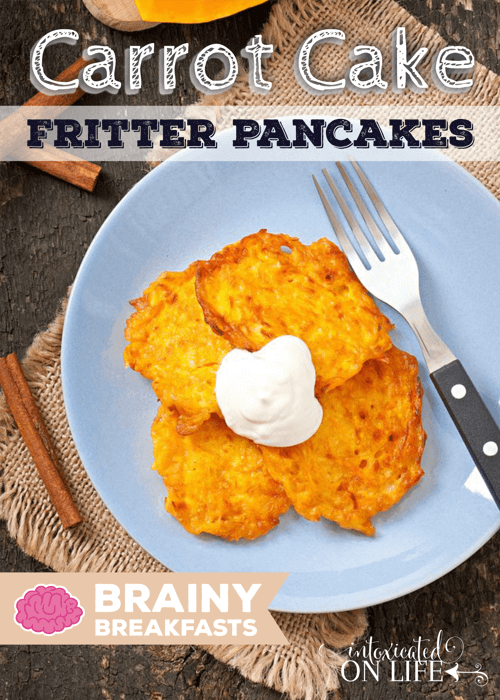 What makes these Carrot Cake Fritter Pancakes such a brain food anyway? There are two main ingredients that give this recipe a brainy boost. Eggs and coconut oil. Let’s dive a wee bit deeper. With every day that passes, your brain shrinks. Yep. Gives a whole new perspective to “shrinking head.” This is part of the natural aging process however, it can be slowed down considerably through diet. Eggs become a key player here. This is because eggs are full of vitamin B12 as well as lecithin. Vitamin B12 helps to fight against brain shrinkage. Eggs are also chalk full of healthy fats and essential fatty acids. Likely you are aware that getting enough of these in your diet is of utmost importance. But when it comes to the brain, do you know why? 60% of the dried brain weight is fat. I’m not a rocket scientist but this tells me that my brain must really thrive on healthy fats, like those found in eggs. Essential fatty acids also support healthy brain structure. The presence of these provides the structure with fluidity while also providing a necessary vehicle for the transportation of proteins which perform vital functions within the brain. The yolk is also high in choline, which is a very important building block of brain cells. It works by stimulating production of the key neurotransmitter Acetylcholine, responsible for memory, mental clarity/focus, and the healthy formation of synaptic connections between neurons. Although we tend to focus on the aging population when it comes to memory and mental clarity, even for younger people, a lack of choline can impair fluid mental function. Inability to focus and concentrate, poor recall of facts, and a feeling of “brain fog” could all be indicators of low levels of choline in the brain. These factors could contribute to disorders like ADHD. Coconut oil is composed of medium chain triglycerides which are small molecules that are pretty easy to break down. This is important because they make a stellar source of “backup energy.” Your brain is an energy hog. At just three pounds, it uses 20% of your daily energy input. Your brain’s main fuel is glucose. However, it cannot store glucose and without the energy the brain cells need, they soon start to die. Remember what I said about coconut oil being a backup energy source? Stay with me here. Your liver can break down stored fat to produce ketones that can be used as a substitute fuel during times of brain cell starvation. But this process isn’t optimal for the body either. The medium-chain triglycerides in coconut oil can also be broken down into ketones by the liver, and readily cross the blood-brain barrier to provide instant energy to brain cells. Cool huh? See why including coconut oil gives your best the best shot at optimal performance all day? Let’s get started on this recipe shall we? 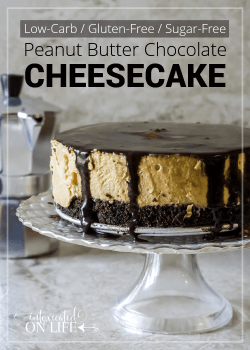 It is super easy, incredibly tasty, and a hit with children and adults alike. Links included below are most likely to one of my affiliate partners. You get the same great price whether you purchase through my link or not. Combine the eggs, coconut oil, and milk in a large bowl and beat together. Add the honey or maple syrup and beat some more. Add the rest of the ingredients, one by one, with the exception of the carrots. Mix together until everything is well blended. Slowly fold in the carrots. Heat a large skillet over medium heat. Spoon about ¼ cup of the batter onto the griddle making little mounds. Flatten a tad with a spatula. Cook for about two minutes or until the tops are covered in bubbles and the edges start to brown. Flip the pancake and cook another 2 minutes or so. Repeat until all of the batter is used up. 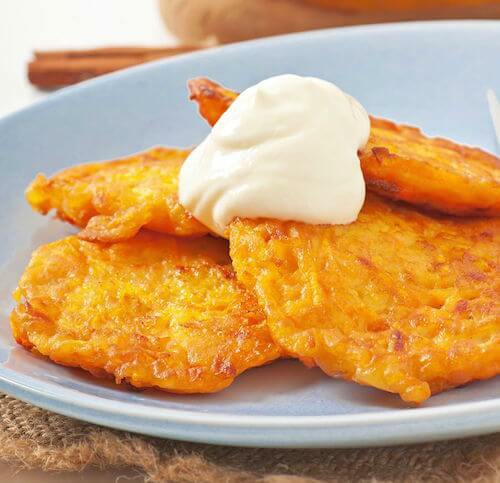 For an extra flare – top with a little cream cheese or fresh whipped cream and chopped crispy pecans! These pancakes freeze well. Double or triple the batch, cool, freeze, then reheat from frozen in a toaster oven for about 15 minutes at 350 degrees. Jennifer, author of Hybrid Rasta Mama, is a former government recruiter turned stay-at-home crunchy mama to a precious daughter brought earthside in early 2009. 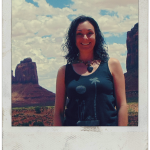 She is passionate about and writes about the benefits of coconut oil, herbs and essential oils, holistic health, natural living, and conscious parenting. Jennifer and her daughter also live an “allergy-friendly” lifestyle sans gluten, grains, eggs, dairy, nuts, and a slew of other foods thanks to a compromised immune system due to toxic mold exposure. She frequently shares allergy friendly recipes on her site. Jennifer has authored three recipe books; Coconut Oil For Your Skin, Cooking With Coconut Oil, and Salve Made Simple. Jennifer also authored and illustrated two print books. I Will Breastfeed Anywhere will empower mothers and their nurslings of all ages to breastfeed when and where they choose! Milkies In The Morning in a gentle night weaning book that Jennifer wrote to ease the transition for her then, four year old daughter. You can learn more about all these book at Jennifer Saleem Books. Keep an eye out for an allergy-friendly nourishing treats cookbook due out in late 2015. The title for these recipes say that they are egg less. The carrot pancakes do have eggs in them. 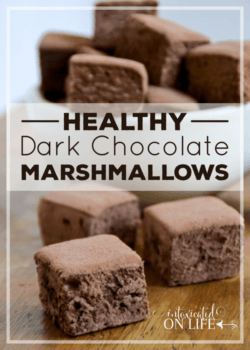 How could I make these without eggs? I apologize, that was my fault. I sent out an email with a list of eggless recipes and obviously didn’t read this recipe closely enough! You could likely use flax or chia “eggs” to make this recipe though. I am very offended when people make wheat out to be sooooo EVIL! People have been eating wheat for thousands of years and now in the last 5-10 years it has suddenly become something so very evil. If North Americans would eat in moderation there would be no problem with wheat in our diet AND we would have enough food to share with our starving brothers and sisters around the world. 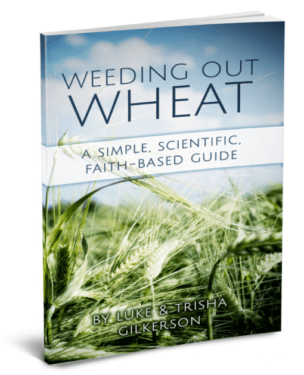 Wheat is not the sin. Gluttony is! I’m not sure who you know that is making wheat out to be evil or sinful. While our family follows a gluten-free diet, it is not because wheat is evil, but because we have received numerous health benefits from following a gluten-free diet. And this type of diet has allowed two of my sons bodies to heal of some problems they were having. It’s also greatly helped to decrease the inflammation that my lyme disease causes. Part of the reason we are seeing such a dramatic rise in the incidence of problems with wheat, is because the wheat we eat today has changed quite a bit from what our grandparents and great-grandparents ate. If you’re interested in reading more about how it’s changed, you can read about it here. 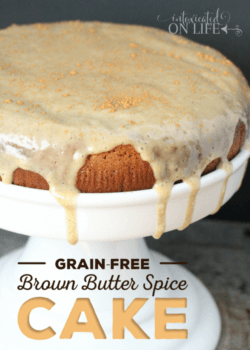 Is it possible to sub out the cassava flour for another gluten free option? And I’ve never heard of vanilla bean powder? I think arrowroot or tapioca flour should work as substitutes! Get ready to make healthy meals your family will love—without feeling overwhelmed! You'll rock your meal plan with this guide. 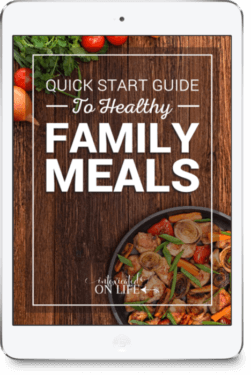 In this free quick-start guide you'll learn 4 simple (but vital) strategies for regularly feeding family healthy meals. You'll also get 3 helpful printable list pages! Join our community of 20,000 healthy-minded folks and grab this free guide.